Cough cough. 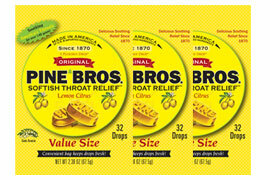 Time to enter to win some Pine Bros. throat relief. Enter this US only giveaway that ends 1/13/15. Good luck. Herman Pine, of Pine Bros. sold his first batch of what he called ‘Pine Brothers Glycerin Tablets.’ In an attempt to relieve his own sore throat. Mr. Pine, a former German confectionery maker, combined the soothing natural qualities of plant glycerin with the healing properties of gum acacia into one softish drop. By doing so, he discovered that he had created a product that could sooth and mitigate the mild discomfort of a sore throat. Add in some natural flavoring and sweetener and Pine Brothers Softish Throat Drops were born. Disclaimer: Participating Blogs were not compensated for this post. No purchase is necessary to enter. One entrant per household, per address. Void where prohibited by law. Winner(s) will be contacted by email and have 48 hours to respond before a new winner is chosen. The K’NEX will be responsible for product shipment to winner of this sweepstakes. This event is in no way administered, sponsored, or endorsed by, or associated with, Facebook and/or Twitter, Google, Pinterest. Contact winterwitch@networkingwitches.com if you have any additional questions or comments. Thank You for the giveaway…PINE BROTHERS THROAT DROPS are available in Natural Honey, Wild Cherry, Licorice, & Lemon Citrus. 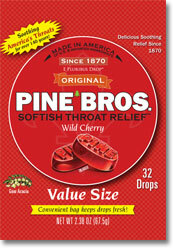 I learned that Pine Brothers has several flavors of throat drops. They are Natural Honey, Lemon Citrus, Wild Cherry and Licorice. I learned that they were founded in 1870. Mr Pine was a former german confectionary maker. I learned they have economy size bags! I learned that they've been around since 1870. Nor has the recipe changed appreciably since it was first introduced to the public over 140 years ago. I learned the Pine brothers spent last New Year's Eve handing out free samples on Boylston Street. Last year the company spent New Years Eve handing out samples to the people of Boston. They have been around since 1870. Since 1870!!!! Then the hiatus! FINALLY they are out again. I loved these cough drops as a kid and I was so so sad when they were gone. Ever since they came back, I've bought them, and my grandkids are hooked on them not. They ask for me to get them some when they have a cough and colds!! I learned that Pine Brothers cough drops were invented by Herman Pine German confectionery maker. I learned that there are four Pine Brothers. They have fun economy sizes. I like that proceeds from the childrens books goes to cancer research. I learned that Ulysses S Grant was president when Herman Pine founded the company. the recipe has not changed appreciably since it was first introduced to the public over 140 years ago. i learned that have a licorice flavor which I had never heard of in a throat drop before. I learned Pine Brothers was founded in 1870. I learned that Herman Pine made his first batch of throat drops in Philadelphia in an attempt to relieve his own sore throat. I learned that the Pine Bros. Throat Drops recipe has not changed appreciably since it was first introduced to the public over 140 years ago. I learned that they were founded in 1870! I learned that they make with natural ingredients. I learned they donate to a pediatric cancer charity (and sell children's books to raise money for the cause). i learned they use all natural ingredients. I learned that even though the package was changed the product is still the same. I learned that Pine Brothers Charity Press has a line of 3 books for kids of all ages. The proceeds from the sales of the books goes to fund pediatric cancer research. They were founded in 1870 and I had never heard of them. They were originally called Pine Brothers Glycerine Tablets. The company has been around since 1870. Ulysses S. Grant was president then. I learned that they have Pine Bros Charity Press which sells books. Profits from the sale of each book go towards funding for pediatric cancer research. If you order all 3 titles, you’ll receive a FREE 3 pack of your favorite Pine Brothers flavor. Mr. Pine, a former German confectionery maker, determined that by combining the soothing natural qualities of glycerin with the healing properties of gum acacia, he could sooth and mitigate the mild discomfort of a sore throat. I learned they were founded in 1870!! I learned that I want to try the Wild Cherry! They were founded in 1870, whoa they have been around A LONG TIME lol. They've been around since 1870. I learned that they have a lot of different flavors and that they were founded in 1870.